Okay.. once again the new year is fast approaching. So, my question to you is this? 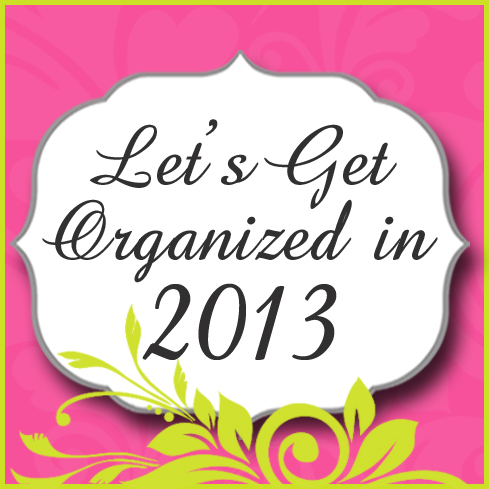 DO YOU WANT TO BECOME MORE ORGANIZED IN 2013? I do! I have goals and I have something NEW & EXCITING coming for Delightful Order in 2013 to help me reach those goals! Do you wonder where to EVEN begin? Well, you're definitely not alone and you're in luck because back in September I wrote an entire post on Where and How to Begin Organizing your Home and Life. Now.. do you want to know what's NEW & EXCITING that's coming in 2013 for Delightful Order? I've decided to begin a CHALLENGE! Yes, a challenge for you all to join me in becoming more organized. It's going to be GREAT ~ a sure way to begin bringing Delightful Order to your home and to your entire life. I'm hoping you'll join me in this challenge. I'll tell you more about it on Monday. I can't wait! Let's Get Organized in 2013! Are you ready? I just found your blog today and I love it! I have been wanting to get my home organized and I think your challenges will be a great inspiration! Can't wait to see what you have in store! I'm loving the organizing posts! So many good ones to use :) Pinning! Can't wait to see what you have in store for us in 2013!!!! I love reading and seeing all your post on getting organized. It always seems to me...the more I try to get organized the worse I get!!!!!! I am hoping that I can get a little better organized in 2013!!!!!! First time seeing this!!! You are simply Amazing!!! I am a single avpctive duty military Momma just returning from deployment... I need this type or organization in my home life! I am inspired!! Thank you!!! I started following your blog a month ago and you've inspired me to get my house more organized. I recently simplified my linen closet and bathroom cupboards. My next goal is to organize my recipes and kitchen cupboards. I've already got binders ready to go for the recipes. I'm also sharing with my 25 year old daughter. She's engaged to be married in May and has decided she wants a recipe themed shower. I'm going to start a set of binders for her as part of her shower present. Thanks for the great tips. I look forward to getting more organized in 2013. Just found you from Pinterest, so glad because my home needs it so bad! I'm your newst follower and I'll be back to see more of your great blog...hope you can help me! Great ideas! All are the best ways to get organized! Purging and simplifying is the order of the day for me! I found your blog via Wendy @ The Life & Times of a Southern Newlywed (http://southern-newlywed.blogspot.com/2013/01/so-long-to-amandas.html ) She said she finds so much inspiration here and I can see why!!! Ok, here is my dilemma. I have tons of storage space in my kitchen and not a lot of stuff, so believe it or not, that has created disorganization. My problem is not knowing how to group things together. I also have a problem with the plastic food storage containers and lids. I have them all stacked in order in my pantry, but they just seem to take up so much space. I would love to know how you handle that. The wire shelves in my pantry are a pain. Spices are another pain for me. They are all together in another pantry that has pull out shelves, but I just don't like where they are. You can't really see them unless you lift up every single jar. My house is not messy by any means, since I don't have a lot of clutter or stuff, but it could definitely use some organization. I think I will tackle under the kitchen sink.